1. Structure folded to small size, can put into the car's trunk. 2. the lightest Folding E-bike ever! 3. Including the good quality Carry bags, which is convenient to take the E-bike to the subway or train. 4. OEM accepted. Customized LOGO, Color, Design available. 5. With Qualified Lithium Battery which is Environmental friendly. Brake System: Front V brake & Rear Holding Brake Charging time: 4-6 Hours Company introduction : ZT E-bike is a new energy electric bicycle with our autonomous development and design, production and test. 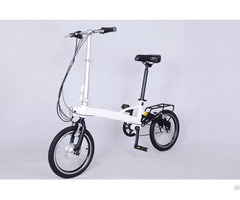 ZT E-bike is different traditional E-bikes with lithium battery. It starts a newer, more stylish and more convenient usage of travel tools. Our goal is to make users reach to destination within 5km more easily and quickly, make more room for tourist’s suitcases, make people control transport vehicles at eash, and let crowded urban transportation is not the factor that affect your life quality. 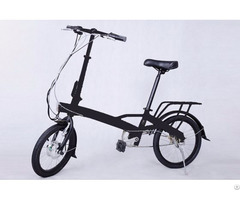 Featured product of ZT E-bike is only 11-13kgs, which can save more space after folding by right design of body structures. It is easy to be tossed in the trunk of your care of your suitcases, taken on board a train, bus or even boat. ZT E-bike is perfect for college student, city commuters, or anyone looking for a fun and easy way to get around. We have passed EMC tests carried out by SGS and have our own patent in EU, our E-bike are widely sold to Europe, US, and Asia, etc. Welcome to contact us for more details. Business Description: Suzhou Zhetai Vehicle Co.,Ltd is located in a beautiful ancient city of Yangzi River---Suzhou. 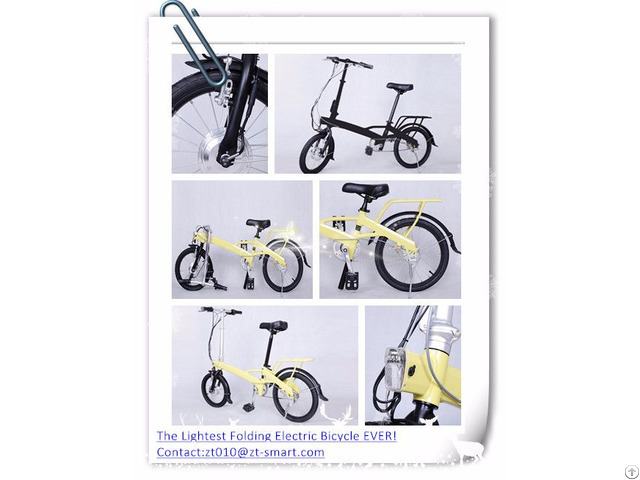 It is a high-tech enterprise including research, design, production, maintenance as well as sale for light and foldable electric bicycles. 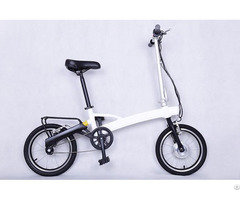 We mainly produce light and foldable E-bikes, and has been devoted to provide customers with convenient, low carbon and environmental protective goods. We opened up a new direction in portable transportation, and will guide a new direction of low carbon life in the future. The quality of our E-bikes is up to international standard, and had passed testing of SGS, TUV, and successfully got certification of CE, EN15194 and EN14764. Suzhou Zhetai Vehicle Co.,Ltd will make continuous technical innovation, stable quality and considerate service, try the best to be “the most convenient personal transportation in the world”.